I can just go on and on about Relativity’s Pivot feature. I have already bragged about its early case assessment potential (see earlier blog posting) but there is more…it can also help you get an overview of the issues in your case. For example, you can run a pie chart of the “issues” coding by custodian. 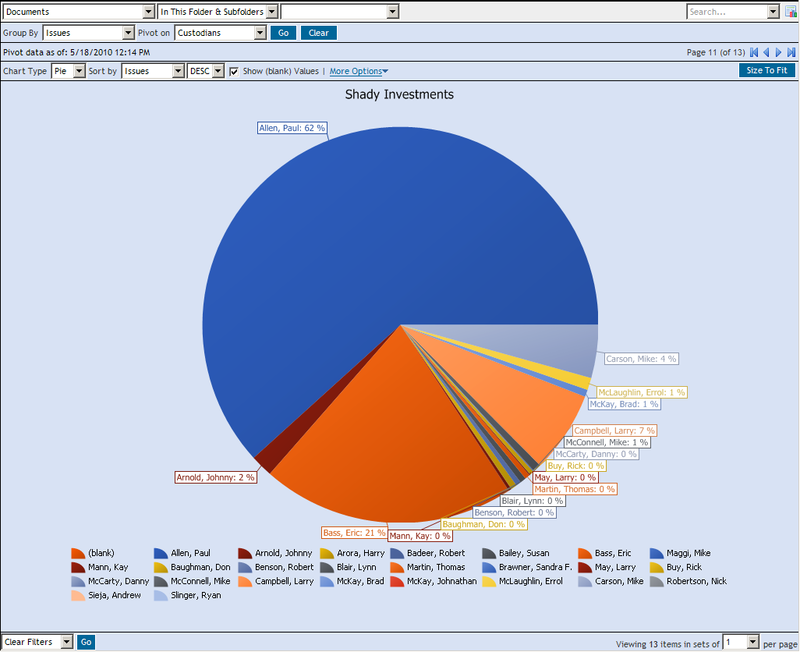 As you can see in the example below, taken from a sales demo database, most of the documents related to the “Shady Investments” issue involve a custodian named Paul Allen, and to a lesser extent, a custodian named Eric Bass. Using this information, the lawyer on this case can now focus on these two custodians for this particular issue and exclude other individuals, such as Larry May or Thomas Martin, who have no documents related to Shady Investments. By running this analysis for each of the issues in your case, you are able to target further discovery and your depositions in your case.